Inspired by April Showers, I've created a Counting Raindrops printable to use with your preschooler to work on 1:1 Correspondence, Sequencing, and Counting 1-10.
small blue manipulatives for "raindrops"
Present the materials to your preschooler on some type of tray. I personally save those hard wooden boxes from Melissa and Doug toys-- they are sturdy and the compartments in this particular tray kept kept the materials separated, but within reach. Have your preschooler pick a card and add that many raindrops. Put the cards in numerical order. Practice addition by putting two cards together and then adding the numbers. Compare raindrops on two cards to find out which number is more than or less than. Using small manipulatives with these counting cards are a great way to sneak in fine motor skills. Small pom poms, buttons, glass gems, sequins, or pony beads are great manipulatives to use for this activity. If you laminate the printable, you could also have your preschooler DRAW raindrops on the printable. Just make sure you wipe off the markings after the activity as sometimes marker stains can prove to be stubborn! Another option is to use these umbrella counting cards and create a little booklet. Cut out each card, assembling them into a pile, and staple along one side. Thus your preschooler can have his/her own counting booklet to keep! 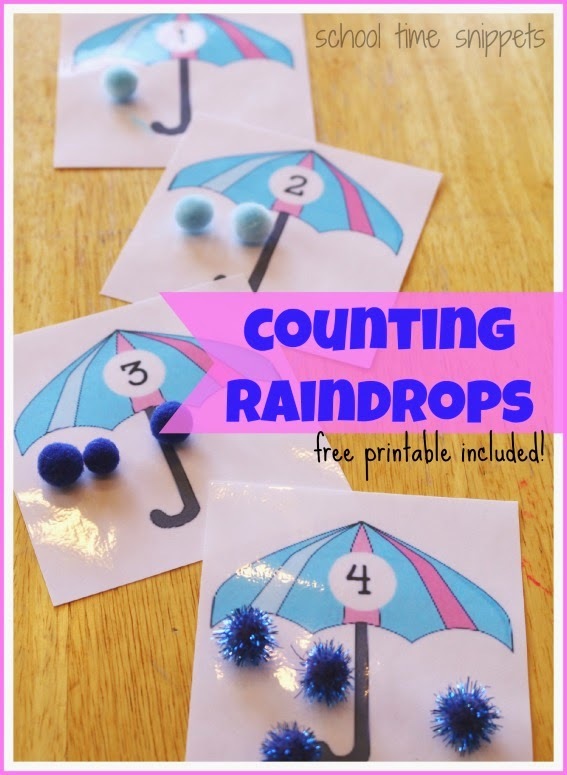 If using as a counting book, provide your child with some small blue stickers to use as raindrops! To work on sequencing/ number order skills, you could have your child clip the numbers in order on a clothesline to work on fine motor skills... or keep it simple and just have your preschooler line them up on the floor. Or set up a "missing number" challenge using these counting cards! Line up several numbers on the floor, but take one out. See if your child can figure out the missing number! So many ways to LEARN & PLAY using these cute umbrella counting cards! !